Wollongbar Primary Industries Institute is a major research centre for NSW Department of Primary Industries located on the NSW Far North Coast. Internationally recognised scientists at the Institute collaborate with a range of industry, Government and other organisations to conduct cutting edge research covering a range of disciplines including soils, horticulture, biofuels, food safety and animal health. Other professional officers at the Institute work closely with local government, other State agencies and community across a range of resource management themes such as aquatic ecosystems, water, land use planning, development and climate. Research and other professional staff at the Institute are supported by internal services such as ICT, information, media, biometrics and administration services. The Institute is well placed to support primary industries with approximately 100 expert staff, state-of-the-art laboratory facilities and more than 500 hectares of prime agricultural land used for research and production activities. Contact Reception on (02) 6626 1200 for conference room details or hire arrangements. The well-appointed testing laboratories for soil and inorganic chemistry are ISO 17025 (NATA) accredited. Contact the Analytical Services customer service line on 1800 675 623. The land comprising the Wollongbar Primary Industries Institute forms part of the breeding component of the North Coast livestock operation which targets the production of 450 calves per annum. Sustainable agricultural practices are employed in the management of the property such that the property can be a practical and credible local example of effective property management techniques. This large two-storeyed wooden house was built in 1901 to accomodate agricultural students at Wollongbar. In the 1880s the local Member of Parliament, Mr Thomas Ewing, made an appeal to the Minister of Mines, Mr James Fletcher, to select a site for an experimental farm in the Richmond, Tweed Rivers area. 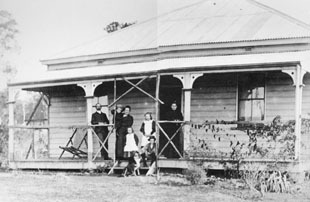 After selecting land at Marom Creek, in 1894, Wollongbar became the second Government Experimental Farm to be founded in New South Wales after Wagga Wagga. The original selection of 106.5ha was covered by dense rainforest vegetation referred to as the "Big Scrub". Experimental work in the first few years of the farm's existence dealt almost wholly with plants. A great variety were tried, including subtropical species, cereal crops, crops for oil and fibre, sugarcane, pulses, fruit and vegetables. Trials with pasture grasses, legumes and fodder crops were also undertaken. Livestock was first mentioned in 1898, when an Ayrshire bull, imported from New Zealand was received at the farm. The initial experimental work on stock was on the disease tick fever, but in the early years of last century the emphasis shifted to dairying where it was to remain for many decades. In accordance with the emphasis on education, a large two-storeyed wooden accommodation building was constructed in 1901 and the first students were enrolled in March 1902. Commencing in 1911, young boys from Britain came to Wollongbar as part of the Dreadnought Scheme. These boys received agricultural training for three to six months before moving into the local workforce. In the 1960s, the station was involved in pig-production research and the development, in conjunction with CSIRO, of a breed of dairy cattle (Australian Milking Zebu) suitable for tropical climates. In 1968, the Regional Veterinary Laboratory was established to provide a diagnostic and research service for the animal industries of the North Coast. In the 1970s an extensive building program commenced which was to transform the station. Old buildings were demolished and new laboratories, offices and research facilities were built. 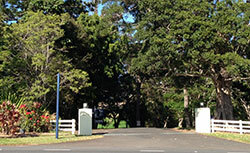 In the new century, as part of the Department's rationalisation and consolidation program, the Chemical Residue Laboratory at Lismore was closed in December 2004 with staff and functions transferred to Wollongbar. The Fisheries Aquatic Habitat Unit was relocated from Ballina to Wollongbar in June 2005, with upgraded office accommodation provided in the Administration Building for eleven staff. Following 106 years of continuous production the Wollongbar Dairy closed in June 2005 with 105 high genetic performance cows transferred to Camden and 27 heifers transferred to Tocal. With over 110 years of service to the local, national and international community, Wollongbar Primary Industries Institute - renamed in July 2008 to reflect the presence of fisheries officers - is continuing to provide high quality research, advisory, regulatory and laboratory services.